Each house has its own history. A house, like a person, consists of joys and sorrows. Each house is the subject for a film – a film about people who loved each other there and then went their separate ways, as well as about people who enjoyed themselves there and wept there. Irena Strüm-Delcroix talks about the former tenement house at 9 Konarskiego Street, where she was born and form where she emigrated to France in 1945 at the age of 21. Thanks to her phenomenal memory, we can recall people who lived in the house and the stories of events that went on there. And although the times were hard, especially for Poles, the story of the house is sentimental and, in parts, sounds like a fairy tale. She warmly recalls Christmas days, tells about the nearby Kazimierza Wielkiego Park and the frog concerts in the park pond. While reading Irena Strüm-Delcroix’s recollections, we almost sense the taste of ice cream from Soravia café at the Teatralny Square, we eat heartily the Wedel chocolate bought in Gdańska Street and ice skate near today’s Philharmonic Hall. The older citizens of Bydgoszcz will remember the tastes and places, while the younger ones will perhaps discover the charm of their city and will seek out these places today. Poles, Germans, Jews and Russians lived at 9 Konarskiego street before the war.Today HOTEL BOHEMA is located there. And Poles, Germans, Jews and Russians live there once again. But now they are also joined by the French, Spaniards and Americans. One can therefore say that the house, since its dawning, has been a place of many nations. Irena Strüm-Delcroix although she spent most of her life outside Bydgoszcz, she never stopped loving the city and the house. And even though she is no longer with us and until recently, she used to drop in at Konarskiego 9 only for a minute, she’s always here. With her heart. 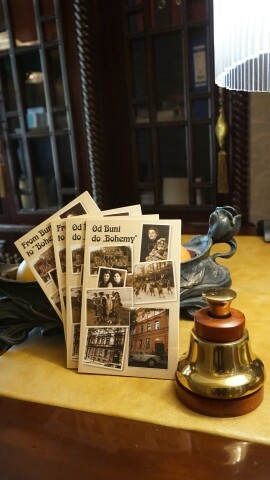 Book with history of our building “From Bunia to Bohema” is at your disposal at Hotel reception and in every room. The history of the former tenement house, where the HOTEL BOHEMA is located today, is fascinating and will light up one’s imagination and emotions. we guarantee that nobody will remain indifferent as they explore this history. Irena Stürm – Delcroix has outlined for us, in her own words and remembrances, the past time of this house and of the city of Bydgoszcz. Now, we and our Guests shall together create a new history of this place. Please, we welcome you to come and stay at our hotel.